Previously codenamed project “Wayne,” the Tegra 4 is built on Cortex-A15 cores, along with a 72-core GPU that produces “record-setting performance and battery life.” That performance was put on display tonight when Huang put a T4-powered tablet up against the Nexus 10 in a browser test. 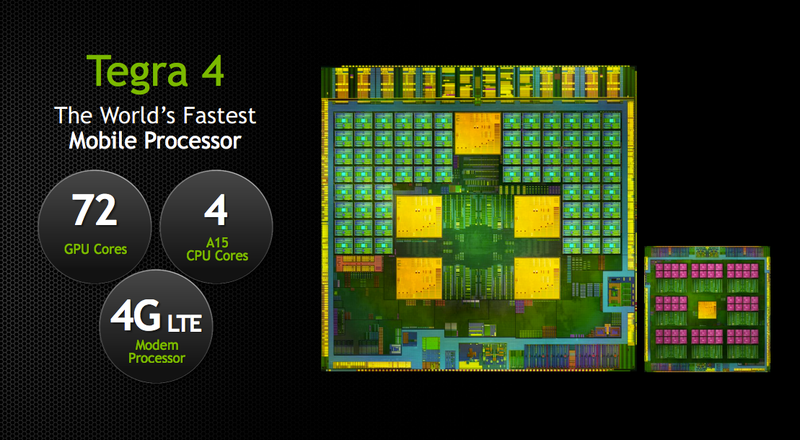 The Tegra 4 ran through 25 pages in around 27 seconds, while the N10 took 50 seconds. It’s remarkably fast. 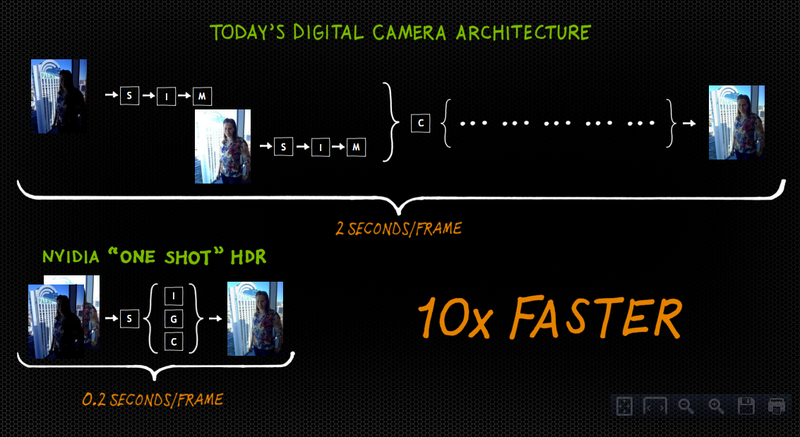 Beyond power and efficiency, NVIDIA talked up its camera capabilities, especially when it comes to HDR photos. Using a Tegra 4, users are able to snap HDR photos like never before. The processor actually allows the image sensor to snap two photos simultaneously to create incredible images. Last, the Tegra also supports 4K ultra-high-definition video output and 4G LTE. Huang mentioned that their LTE modems are sampling now, so it sounds like the chip is not quite ready for smartphones. He did, however, show off a preview for Will Smith’s new movie “After Earth” in 4K, streaming from the Project Shield device to an LG 4K TV. No availability was mentioned at all other than parts being sampled. The prototype tablet they showed was actually a Windows tablet running stock Android. It’s pretty clear that the T4 is fresh out of development and could take some time before it’s ready for prime time. You never know, we may see it in a device at MWC in February, but don’t be surprised if it takes a bit longer. LAS VEGAS, NV–(Marketwire – Jan 7, 2013) – CES — NVIDIA today introduced NVIDIA® Tegra® 4, the world’s fastest mobile processor, with record-setting performance and battery life to flawlessly power smartphones and tablets, gaming devices, auto infotainment and navigation systems, and PCs. Tegra 4 offers exceptional graphics processing, with lightning-fast web browsing, stunning visuals and new camera capabilities through computational photography. Previously codenamed “Wayne,” Tegra 4 features 72 custom NVIDIA GeForce™ GPU cores — or six times the GPU horsepower of Tegra 3 — which deliver more realistic gaming experiences and higher resolution displays. It includes the first quad-core application of ARM’s most advanced CPU core, the Cortex-A15, which delivers 2.6x faster web browsing and breakthrough performance for apps. Tegra 4 also enables worldwide 4G LTE voice and data support through an optional chipset, the fifth-generation NVIDIA Icera® i500 processor. More efficient and 40 percent the size of conventional modems, i500 delivers four times the processing capability of its predecessor. 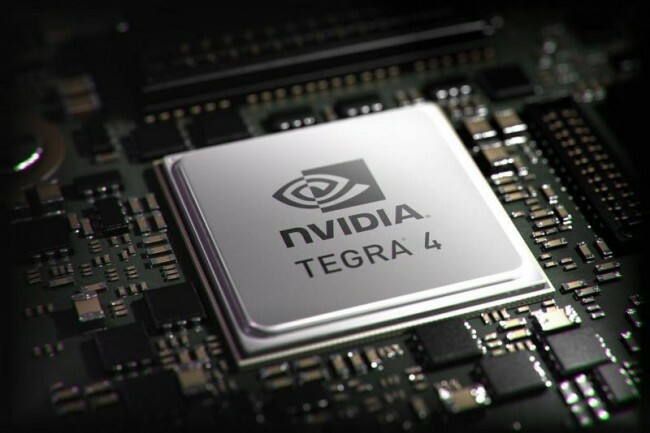 Among the Tegra 4 processor’s breakthroughs is its Computational Photography Architecture, which automatically delivers high dynamic range (HDR) photos and video by fusing together the processing power of the GPU, CPU and the camera’s image-signal processor. Its HDR capability captures images, including those taken with a flash, the way they are seen by the human eye — with detail in both bright and dark areas. Designed for maximum energy efficiency, Tegra 4 includes a second-generation battery saver core for low power during standard use, and PRISM 2 Display technology to reduce backlight power while delivering superior visuals. Tegra 4 consumes up to 45 percent less power than its predecessor, Tegra 3, in common use cases. And it enables up to 14 hours of HD video playback on phones. NVIDIA (NASDAQ: NVDA) awakened the world to computer graphics when it invented the GPU in 1999. Today, its processors power a broad range of products from smartphones tosupercomputers. NVIDIA’s mobile processors are used in cell phones, tablets and auto infotainment systems. PC gamers rely on GPUs to enjoy spectacularly immersive worlds. Professionals use them to create 3D graphics and visual effects in movies and to design everything from golf clubs to jumbo jets. And researchers utilize GPUs to advance the frontiers of science withhigh performance computing. The company has more than 5,000 patents issued, allowed or filed, including ones covering ideas essential to modern computing. For more information, seewww.nvidia.com.